There’s nothing better on St. Patrick’s Day than a clover pin and a fun holiday-themed tee shirt. Unless, of course, you’re over the legal drinking age – in which case there’s nothing better than a Guinness and some Bailey’s Irish Creme. 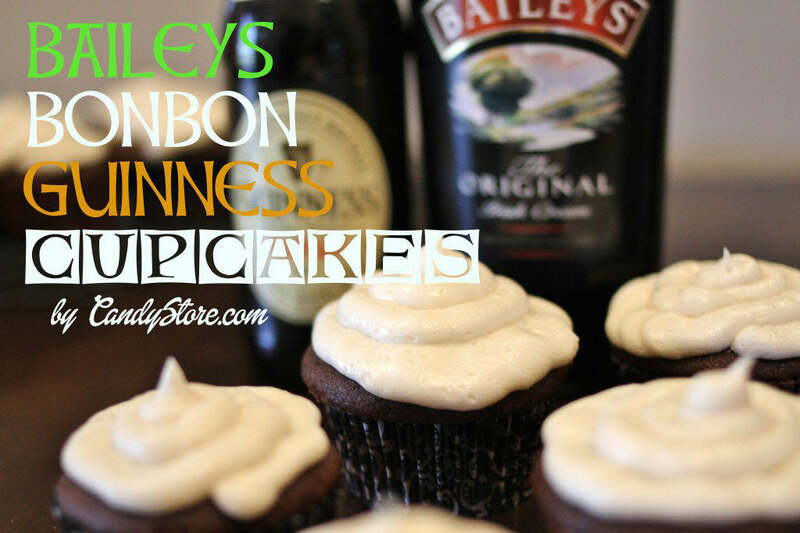 And if you happen to be obsessed with desserts like we are, then there’s really absolutely nothing as marvelous as cupcakes with both of these Irish alcohols baked inside of them: Bailey’s and Guinness Cupcakes! We’re not quite sure who created the first Guinness Cupcakes recipe but it’s safe to say that it has been an instant classic. As far as dessert bloggers go these days, you aren’t anybody unless you’ve come up with your own take on this boozy holiday treat. Some bakers have tried to be original by adding Bailey’s Irish Cream to the frosting. Others have devised a recipe for Jameson ganache. But so far, nobody has tried to incorporate the one thing that matters most around these parts – candy. Specifically, we’re talking about those awesome Bailey’s cream-filled bonbons. 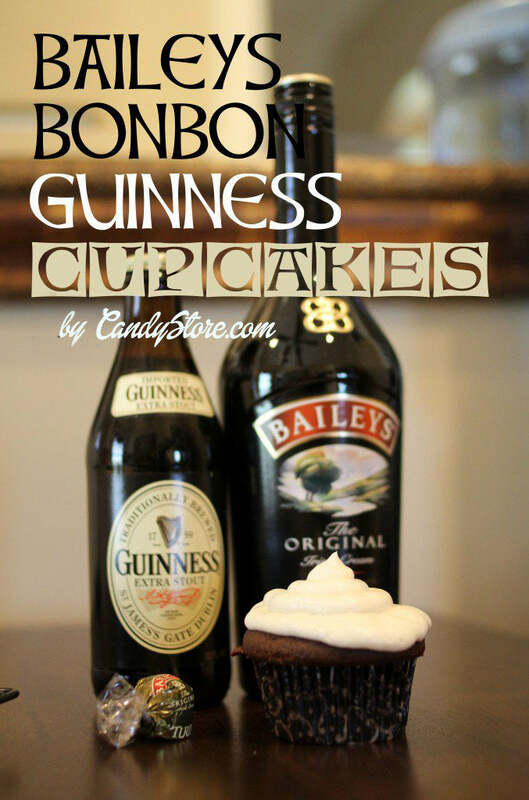 So today, ladies and gentleman, the CandyStore.com blog is breaking new ground by publishing a totally new, totally original interpretation of the classic Guinness Cupcakes. Made from scratch, these awesome holiday treats feature a cocoa-stout batter stuffed with a Bailey’s Cream bonbon and topped off with Bailey’s infused buttercream. We’re not ones to judge, but eating one of these fancy little monsters on March 17th might be the classiest thing you do all day. They’re classy, they’re delicious and they pack just enough punch to make them Irish-approved. And if that’s not enticing enough, you’re going to be blown away at how easy they are to make. Seriously – just check out the recipe. 1. Preheat the oven to 350 degrees Fahrenheit. Stick some fun baking cups in a cupcake pan. Spray the interior with non-stick cooking spray to, you know, prevent sticking. 2. Warm a sauce pan over medium-low heat. Add butter, Guinness, cocoa powder and brown sugar. Mix until everything is combined and smooth. Let cool to room temperature. 3. In a mixing bowl, combine flour, salt, baking soda and white sugar. Seriously – combine it. When everything is mixed together, pour in the Guinness sauce. Blend on Medium for two minutes or until smooth. 4. Using a rubber spatula, ice cream scoop or whatever you have handy, scoop a small base layer of batter into each baking cup in your cupcake pan. 5. Add a Bailey’s chocolate to each pan. Press down slightly to set it. Then cover the chocolate in batter until each cup is 2/3 to ¾ of the way full. 6. Bake for 20 Minutes or until you can stick a toothpick through the center of a cupcake and remove it cleanly. 7. Let the cupcakes cool completely before you ice them. 1. Warm the butter in the microwave for about 10 seconds. Place it into the mixing bowl. Add salt and a cup of confectioners’ sugar. Blend on low until fluffy. 2. Add Bailey’s Irish Creme, milk and another cup of confectioners’ sugar. Blend on medium. 3. Slowly pour in remaining confectioners’ sugar while continuing to blend. to your friends and loved ones. We’re not going to say that this is the best Guinness cupcake recipe ever published, but we aren’t going to stop you from saying it. 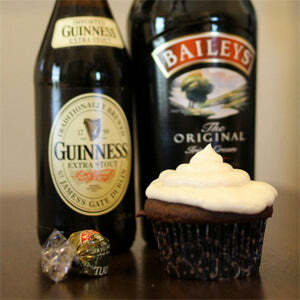 Whip up a batch of Bailey’s Bonbon Guinness Cupcakes for your loved ones and get a little lucky this St. Patrick’s Day. As easy to bake as they are delicious to eat, they’re the perfect complement for those, erm, other activities people traditionally enjoy on the 17th of March. Let us know what you think by posting in the comments section below!